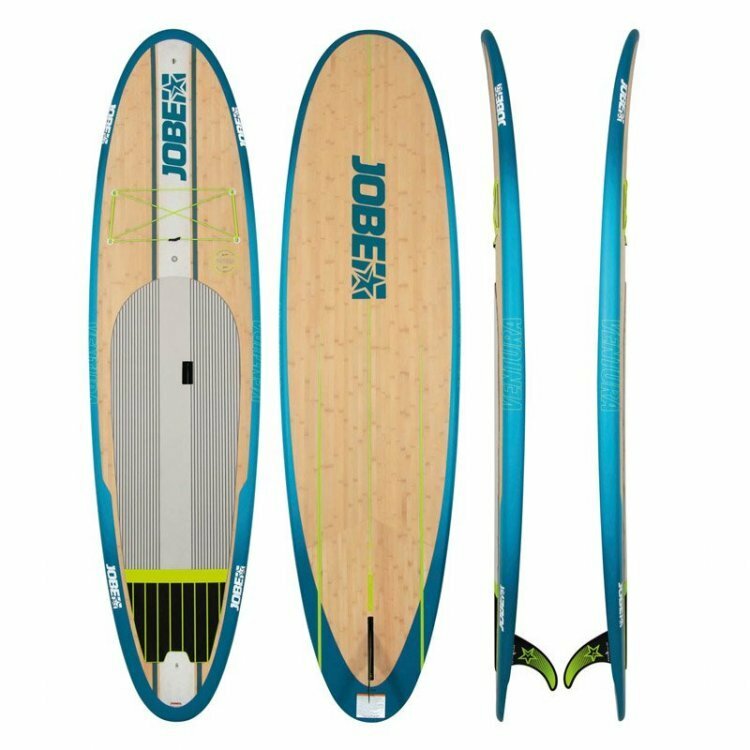 Jobe Ventura 10.6 SUP – SUP, Windsurfing UK. With a bamboo and blue styling, the Jobe Ventura board looks as good as it feels with some great performance being offer up by the classic longboard shape. Certainly for a hard board, the Jobe Ventura 10’6 is a do everything board. Carrying enough volume to float bigger riders, the Jobe Ventura can be used for sup surfing, cruising and play. I’m not going to say it’s a tourer as the waterline isn’t long enough to offer that level of glide, but it is by no means slow on the flat. The Jobe Ventura 10’6 has a user friendly shape but with the added bonus of offering more performance when needed. With any hard sup you need a rocker line suited to the task and this varies for each and every shaped board so there’s no one simple line. With the Jobe Ventura, you get a constant soft rocker line, that helps improve flat water experience, whilst giving manouverability when in small waves. The Jobe Ventura has a classic profile shape with a rounder nose and tail that offers up a level of stability, whilst maintaining a good speed if on the flat. That said it also makes it really easy and relaxed to enjoy surfing this board in smaller conditions. For anyone going out in choppier water, they’ll find that the width is a real bonus as it locks the board down to a super stable platform. If you’ve come from a world of inflatable paddle boards you’ll definitely notice the extra connection between water and paddler. On the deck we have got front bungees that are handy for packing the flip flops under or a small waterproof bag, but if you fancy doing some nose riding this could easily be taken off so you don’t trip over it. Much like other hard boards, you’ve got thinner rails so you can feel more bite when on a wave, but with a board of 10’6 you really need to move about and learn to adjust your standing position to really get the most from it. The single fin design on this board is deliberate as you don’t need side biters so a decent tool-less centre fin is provided to give a classic longboard feel. Keeping the board looking pretty is something else we’ve considered so you get a rail saver, which will stop you bashing the rails up. If you're still unsure why not come and TRY the Jobe Ventura 10'6 2018 sup and make up your own mind! The Jobe Ventura 10’6 2018 package really is a great deal. Any water sport is dangerous and we advise that all persons engaging in any form of stand up paddle boarding should assess their abilities and take suitable precautions.